As we reported last week, a catastrophic dam failure at the Samarco iron mine in southern Brazil killed 11 and left 12 missing, buried the town of Bento Rodrigues under millions of cubic meters of toxic mine waste, and left thousands across the region without clean water. Troublingly, the threat of further flooding persists as heavy rains move in and mine operators BHB Billiton and Vale SA scramble to shore up the remaining impoundments. DigitalGlobe and Google Earth have acquired high resolution imagery of the aftermath, and there are several issues of which mine workers, downstream residents, and emergency responders need to be mindful. 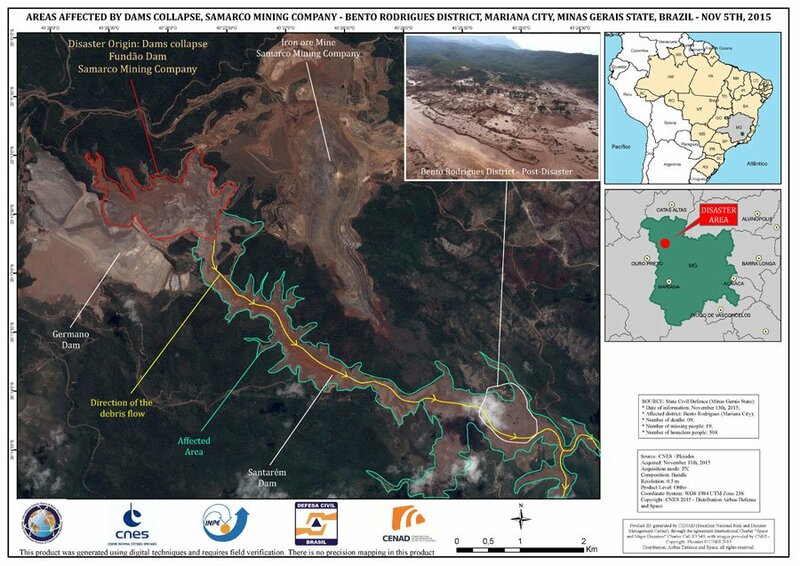 First of all, the Santarem impoundment immediately downstream from the failed dam did not break in the initial deluge, though it could very well have been damaged by the 40 million cubic meters of water and mine waste that poured down from Fundao. In the image below you can see that Santarem Dam is still intact, evidenced by visible spillway, but we don’t know whether or not the dam’s structural integrity has been compromised by stress and erosion. To the southwest of the failed Fundao dam is the Germano Dam, Samarco’s oldest and largest tailings impoundment. Reportedly this dam is drier and more stable than Santarem and Fundao, but all told the mine operator is mobilizing 500,000 cubic meters of rock to shore up both remaining dams. Reuters reports the repairs could take from 45 to 90 days, meanwhile the regional weather forecasts call for thunderstorms for the next 10 days. 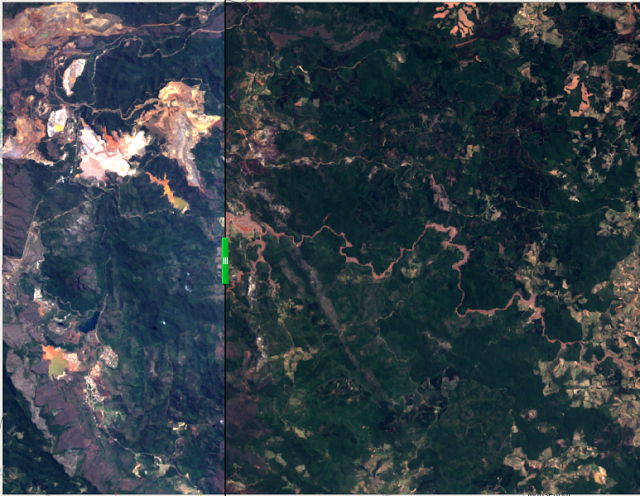 Below is the surviving Germano Dam (bottom left) and the failed Fundao Dam (center). The devastation is not just local, it extends far downstream. At the far eastern edge of DigitalGlobe’s recent acquisition, 40 km away as-the-crow-flies, a small farm/compound was partially wiped out by the flood of toxic red mud. You can see a bridge wiped out, the floodplain inundated, and multiple structures erased by the force of the flash flood. To put this disaster in perspective, current estimates put the volume of the flood so far at 40 million cubic meters of mud, debris, and toxic waste. That makes this spill 2.6x larger than the infamous Johnstown Flood which killed over 2,200 in Pennsylvania back in 1889. We urge everyone living and working in the area and downstream to exercise extreme caution. The company reports they are monitoring the surviving dams with “radar, lasers, and drones,” but as the last image shows, the impact of another spill could be deadly even miles away from Bento Rodrigues. To view the imagery yourself in Google Earth, download this KML from Google Earth Outreach and DigitalGlobe. We don’t usually do seasonally-themed maps, but this map tracing the footprint of wellpads in Ohio’s Marcellus and Utica Shales just happens to work best with the colors associated with All Hallows Eve. Over the past year our FrackFinders and partners at Walsh University have helped us map shale drilling in eastern Ohio. Below you can see the total area of area of wellpads displayed using scaled “bubbles” which show the size of the wellpads relative to each other. This top-level view helps you see where drilling is the densest, and locate the largest and smallest wellpads. If you zoom in closer, you will see the actual outline of individual wellpads to scale. In this map there are 320 sites, all traced out by students at Walsh University participating in our FrackFinder collaborative image analysis projects. The median area of these wellpads is 13,787 square meters, or 3.4 acres. If you recall, we recently used this number to help visualize similar drilling in western Pennsylvania. The largest pad was 17 acres and the smallest pad was 0.6, and all told we found 1,100 acres of Ohio fields and forest converted to gravel wellpads. The total impact of drilling extends beyond just the wellpads we mapped in this phase of the project, so in future we will be working to repeat this approach in other states and looking at total landscape impacts. This tutorial video we created for the project will show you exactly what we’ve mapped here. Understanding the public and environmental impacts of drilling is complicated, especially since these industrial operations are scattered all across the landscape; some sites are remote while others are right next to homes and farms. But the data you help create in these projects enable SkyTruth and our partners to correlate this data about when and where drilling occurred with public health and environmental data. This research is starting to bear fruit as our partners at Johns Hopkins recently released a study showing that living in the most active quarter of Pennsylvania’s Marcellus gasfield was associated with a 40% increase in the likelihood of pregnant mothers giving birth prematurely. Scary indeed.